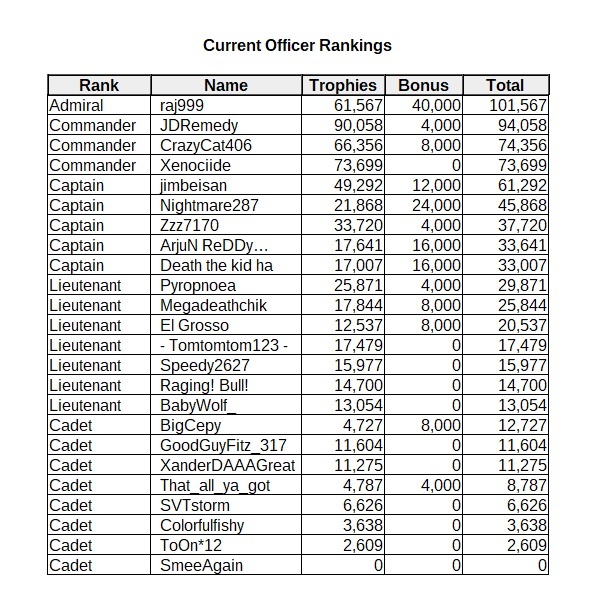 Discussion in 'Guild Recruitment' started by CrazyCat, 8 Mar 2019. All that matters is winning Rivalries! This was the type of battle that sport spectators love to see play out - 4 spirited teams with "never surrender" mentalities fighting it out until time runs out. Front-runner status flipped at least a dozen times as each team came back from 3rd or 4th place to retake the lead once again. Much respect goes out to the zlzlzlzlzl, Dragon6789, and Love of Alzix guilds. The previous version of how our 8th fight played out was from a spectator’s perspective -- an outsider looking in. However, only those within our guild truly understood what it felt like on the front lines, fighting under a leader determined to win. The following quotes are copies of messages I sent to guild members midway during that rivalry, at its conclusion, and midway into our 9th fight. Life in Whatever! is not for the faint of heart. Instead of simply playing to win, we are on a mission. Players who cry, complain, wimp-out, and do not support their team should not seek us out. On the contrary, we seek the die-hard, never-give-in fighters, who can sway the outcomes of hard-fought battles. To all guild members: The rivalry is still very close, so earlier today I had to kick InnocentDove & Subbu from the guild. They were the next weakest members, after SVTturkuda [who was kicked 2 days earlier]. … To a new recruit: As the game keeps pitting us against stronger competition, we have to grow stronger to keep winning. So, periodically, about midway through a rivalry, I will kick the weakest player (lowest trophy winner) & replace him with the strongest player I can find, then possibly kick the next weakest player, replace him & so on. New members have to prove that they are powerful enough to stay. I have often kicked new members within a day or so, because they didn’t win enough trophies quickly. To all guild members: That was our toughest fight yet, but WE. NEVER. SURRENDERED. We kept fighting until the very end and managed to claw our way back from 4th place to 2nd in the final hours of the match. We showed Fantastic spirit, grit, and determination to win. These are the matches that will stay in your mind. Teams that can come back from the edge of defeat to vie for victory are the ones that inspire people the most. We did good. 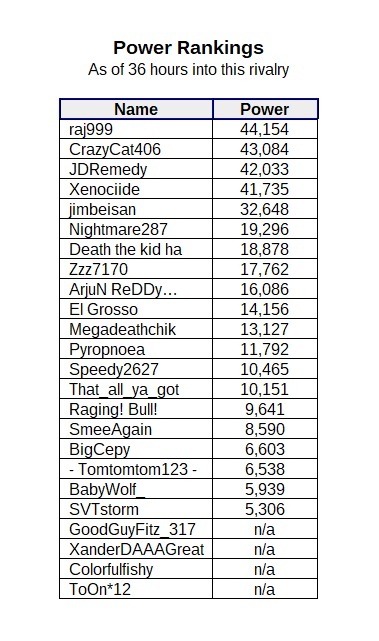 At the end of the rivalry there were over 30 names on our contribution list. I had kicked 5 of our active players and 3 of the new recruits. I even had to kick one new recruit twice within the same day, after giving him a second chance. For many of you, it was a shocking experience because I haven’t been kicking players recently. 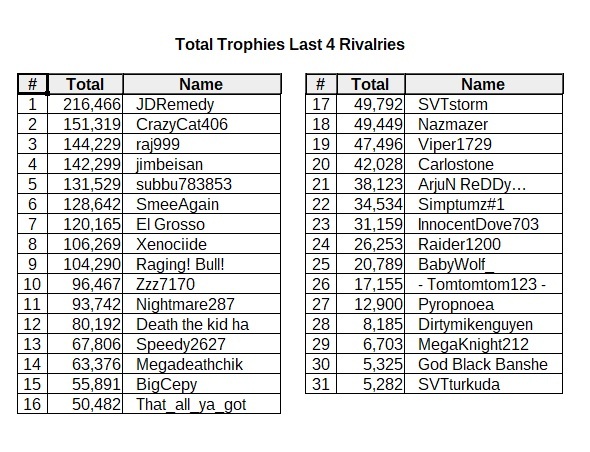 Yet, as SVTstorm can tell you (he was present during our first rivalry), I was routinely kicking out 5+ active players a week back in the beginning. Unfortunately, the kicking will continue until we grow stronger. ... To a new recruit: During the last rivalry I faced some tough kick decisions due to the absence of two players w/real life conflicts that had been heavy hitters, so I decided to standardize the process & make it transparent. 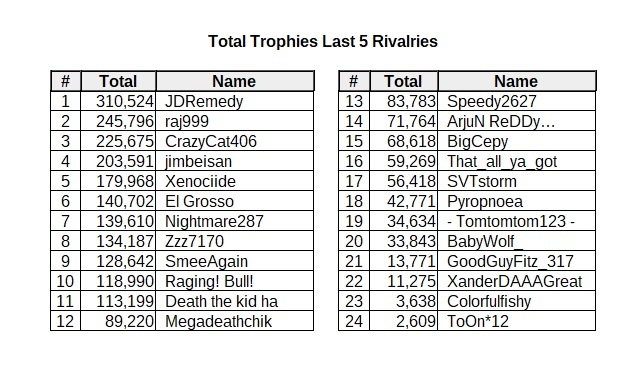 Kick order is now determined by everyone’s ‘power’ ranking: current trophy count + 35% of the previous rivalry trophies + 15% of trophies from the rivalry before that. 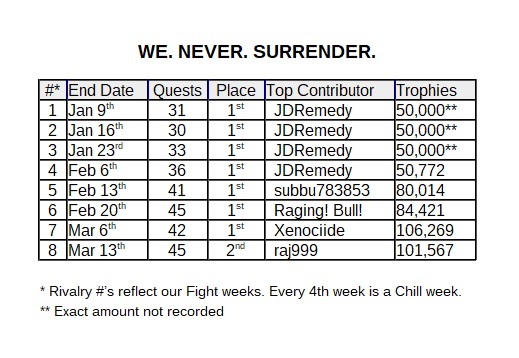 To all guild members: For the first time since we formed the guild, JDRemedy hasn’t been here save our @$$. This means that *everybody* has to do better. Please do not be offended by what I am about to say - I am attempting to give everyone a fair warning:: Until Whatever! becomes strong once again, the *only* players that are in no danger of being kicked are those who have won more trophies than me. 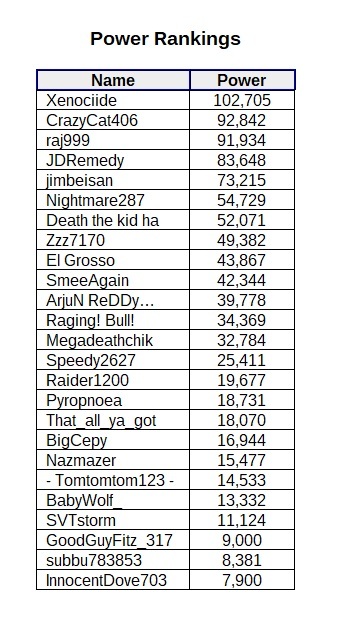 I will not kick anyone who has outperformed me in the current rivalry. 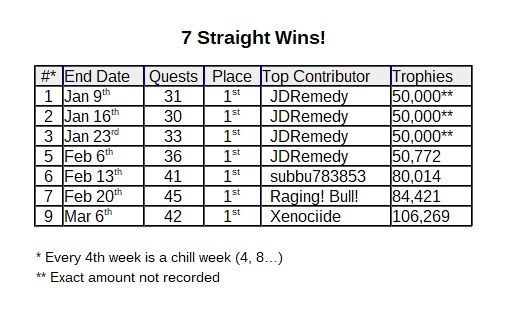 As SVTstorm can tell you, I routinely kicked & replaced 5+ players a week back in the beginning. Storm is the last surviving guild-mate, who was with JD and me during our first 2 Rivalries. Last week I had to kick InnocentDove, who was the only other guild-mate that was with us during our second rivalry. Kicking Dove was hard to do. Dove had survived all those massive kick weeks, usually by the thinnest margins. I often kicked everyone below him. Like Dove, I don’t want to kick Storm out. Storm was one of my first 5 officers. He earned his promotion for his exceptional performance during our first rivalry. I don’t want to kick Storm or anyone else out. But..
My goal is very personal to me & it comes before all else. I won’t let sentimentality or friendships stand in the way. If I need to kick Storm or Nightmare or Megadethchik or 10 guild-mates in one rivalry, then I will do so. It’s been good playing with all of you. If you get kicked out, I will be happy to bring you back if you become more active. // I’m going to stop talking about this now. I’ll be on the Bay. It turned my stomach to have to send this last message to my guild-mates. I am not proud to post it here. I do so to memorialize the moment. The members of Whatever! are survivors. To be honest, all contributions are too low, but great job writing all this down. Is it possible to prevent non-Whatever! members from desecrating our guild recruitment thread? Comments will likely get worse as we continue to beat Top-100 ranked Guilds. You have opened this thread to the public, and as per forum rules, said thread is open to replies. However, rest assured that if the thread becomes uncivil, I shall intervene. Nicolas actually has a point. 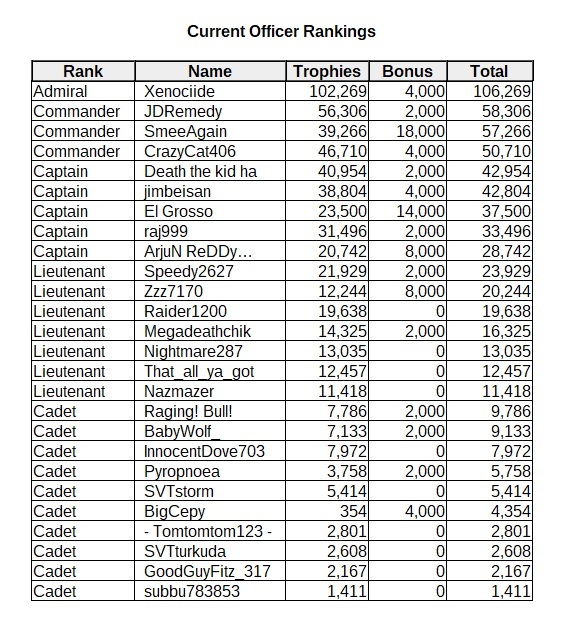 While I enjoyed reading your thread, being an ex-top 50 guild member, I've had my personal contributions go up to 200k trophies and was still LOWER than three other members of my guild at the time. And ofc I've seen insanely cutthroat guilds NOT in the top 50, such as @Reorge 's guild, that have MINIMUMS set to 150k trophies per member. Friendly tip: Get guildmates to invest into superboosts. They make A LOT of difference in a push. Nicolas and Nikkie! like this. @CrazyCat I'm just saying you might become a good leader soon because you manage your guild like this. Here is a tip from me, it's not all about trophies. Go for quality contributors not just quantity contributors. You don't want to finish 11 out of 12 quests then get stuck on one quest. So you were one of those monsters who helped TDT versus Silencio? Damn. That's cred right there. It's my family. I played for tdte for about 5 months.